Triad: Boston's Choral Collective will be holding its spring auditions on Sunday, January 27, 2019 from 4-7pm. We are auditioning for all voice types and are interested in hearing singers who conduct and/or compose, as well as those who do not. All singers should have a high level of training, the ability to sight-read, and a willingness to take part in the organizational aspects of the choir. Triad intends to pay each performer a $250 honorarium for the Spring season. Pay is contingent upon fundraising efforts that, as a collective, all members are encouraged to participate in. One short solo to be sung a capella. This may be as simple as a hymn. Prepare your own part of measures 10-26 of Child (download here). There will be a sight-singing exercise as part of the audition. In addition to singing the above, prepare to conduct measures 10-26 of Child. Please include examples of pieces you have written when you send your materials. Rehearsals traditionally have been held Monday evenings 7:30-9:30. These are subject to change with agreement from the entire membership, including new members, after the auditions. Those interested should email us at auditions@triadchoir.org. Please include your resume or bio and your availability on January 27th. We will then send you the audition materials to prepare. If you are interesting in singing with us, but cannot audition on January 27th, please contact us. We will make every effort to hear you on another date. How do you know if you're right for Triad? Singer: has trained, can read, is willing to prepare work (e.g. sing at a professional level), and is willing to share your vocal knowledge to build a unified ensemble approach to the demands of new music. Composer: can sing (see above), has interest in writing for choral ensembles and is interested in taking and offering feedback, and working with other composers to guide decisions around compositional choices for the group. Conductor: can sing (see above), has experience with choral ensembles, and is interested in taking and offering feedback, and working with other conductors to help guide ensemble decisions regarding repertoire and concert dynamics, and willing to work with other conductors and singing leaders to create a unified vocal approach. All: are enthusiastic to work in a collaborative setting (wherein your opinion is always valued but not always chosen), willing to participate in organizational systems that allow collective leadership to thrive (e.g. when and how to give feedback), open to serving in non-musical capacities as well as musical leadership (on a board, setting up for concerts, fund raising, marketing, preparing programs, etc.). The season's payment is dependent on fundraising efforts. As an organization comprised of professional musicians, our goal is to pay our performers an honorarium at the end of this season. 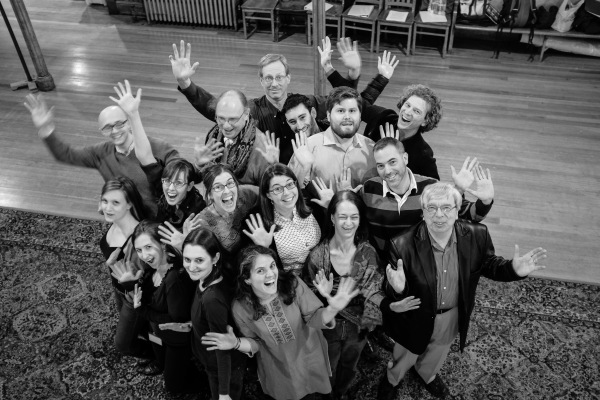 Triad: Boston’s Choral Collective is a professional ensemble in Boston entering its third season. The organizational model is based on New York's C4 Choral Composer/Conductor Collective (c4ensemble.org). C4 has had significant success based on its collective organization in which: everyone sings well, those who conduct share the podium based on their abilities, those who compose write pieces for the ensemble, and all members share in organizational roles. There is a significant amount of skill share integral to the process, so that those aspiring to gain new skills will find a chance. Repertoire is chosen from music written in the last 25 years, which is loads of fun and extremely interesting.